The Society presents a full and varied programme of events throughout the year. Evening meetings are held in Southampton. There is one afternoon meeting each month held in Chandler's Ford, Eastleigh, just north of Southampton. Prospective members are welcome to attend the first meeting of the month to meet other members and sample the quality of evening provided. Please contact (02380 402194) for more information. Evening meetings are held on the first and third Tuesday of each month at St. Joseph's Church Hall, Bugle Street, Southampton, SO14 2AH. Start at 7.00 pm for 7.15 pm. Location Map. Afternoon meetings are held on the second Thursday of each month at The Hanover Housing Association Community Room, on the corner of Hillside Close and Winchester Road, Chandler's Ford, SO53 2GL at 2.00 pm. For information regarding the afternoon meetings please contact Mike Vokes (023 8026 2551). Location Map, and Map of the area. 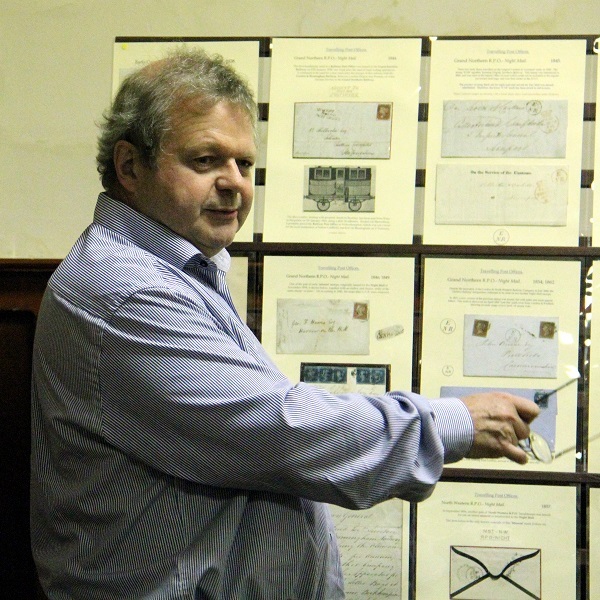 At the first meeting of each month an invited speaker presents a philatelic display on a particular subject. Typically, 180 sheets of material are shown in two sessions with a break for viewing and discussion with coffee or tea, and biscuits. 10 Salisbury & District Philatelic Society Auction at Harnham Scout Hall, Lower Street, Harnham, SALISBURY SP2 8HB. Doors Open 7pm. Auction Catalogue. 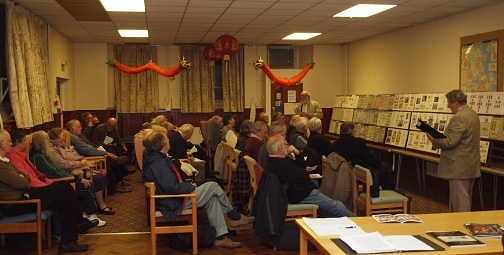 16 AGM and " Queries & Acquisitions "
Clive Jones was the guest speaker at the 2018 President's Evening with his display entitled Travelling Post Offices of Great Britain. Photo courtesy Eddie Mays. 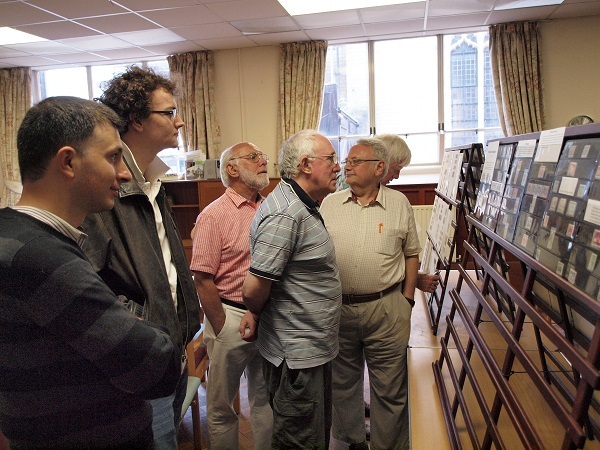 Members discussing techniques at a workshop on How to Create a Philatelic Exhibit held at St Joseph's Church Hall, Bugle St, Southampton. Photo courtesy Steve Gerrard. A meeting at St Joseph's Church Hall, Bugle St, Southampton. Photo courtesy Steve Gerrard. 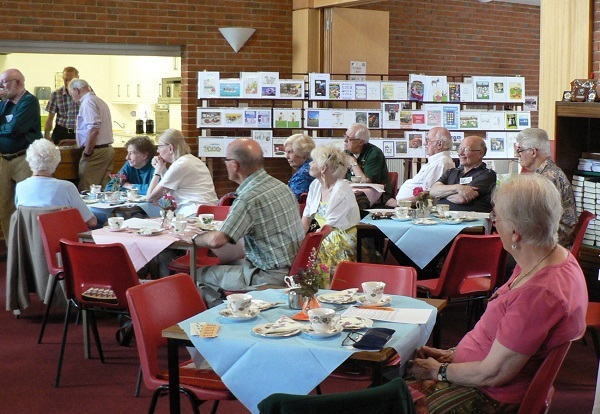 A summer afternoon "Sociable" meeting at Chandler's Ford, July 2015. Photo courtesy Debbie Hindson. Click for reports. 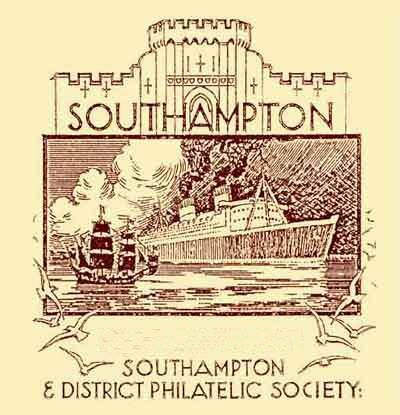 Details of other events in Hampshire and surrounding areas are available on the Hampshire Philatelic Federation and Bournemouth Philately websites. Details of National events are available from the ABPS Events Listing website. The HPF Bulletin may be downloaded from the Postmark page. ABPS News is available from the ABPS News page.